For our last U.S. LinkedIn Workforce Report of the year, we’re taking a look at what 2017 looked like in terms of hiring, the industries that created the most jobs, and which cities lost the most and gained the most workers. U.S. hiring was 10.4 percent higher in 2017 than in 2016 – Since skyrocketing this past May, hiring in 2017 has stayed consistently strong, without great variation month over month. Year-to-date, U.S. hiring has been 10.4 percent higher in 2017 than in 2016. 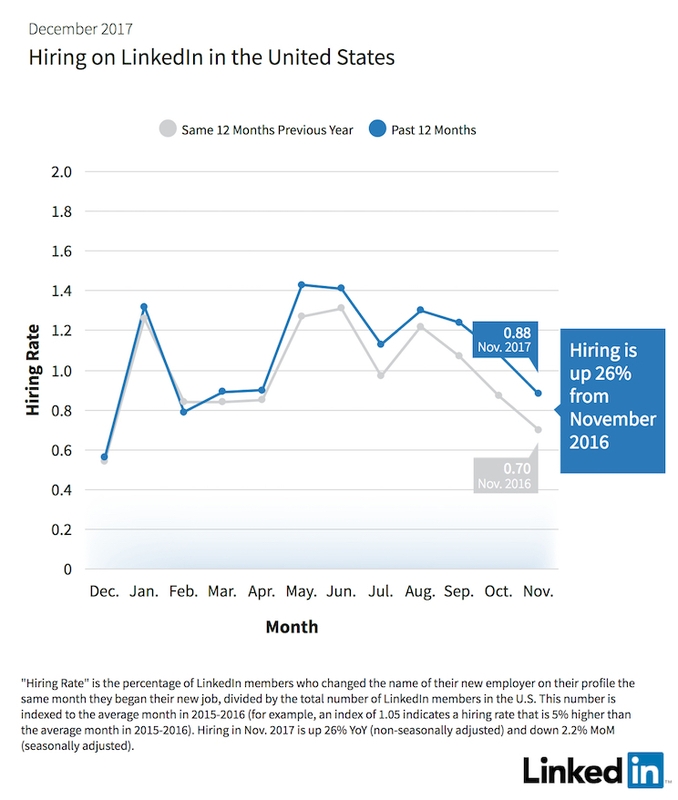 In November, hiring across the U.S. was 26.0 percent higher than in November 2016. Seasonally-adjusted hiring (hiring that excludes seasonal hiring variations) was 2.2 percent lower in November than in October this year. The industries that experienced the biggest year-over-year increases in hiring in November were financial services and insurance (26.8 percent higher); oil and energy (25.4 percent higher); and manufacturing and industrial (25.0 percent higher). 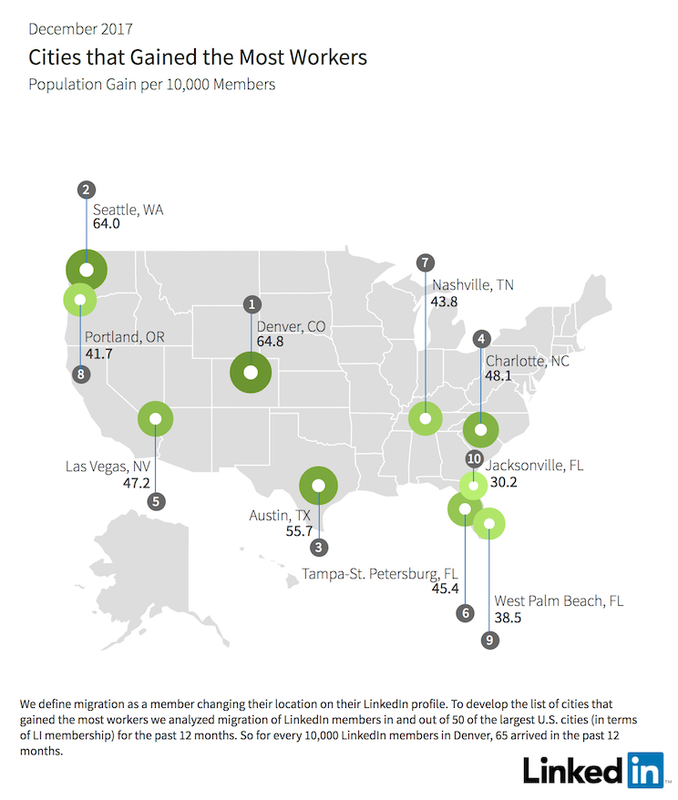 In 2017, skills gaps widened in Salt Lake City, Raleigh-Durham, and Philadelphia – Over the past year, skills gaps — the gaps between the skills workers have and the skills employers need — have widened the most in Salt Lake City, Raleigh-Durham, and Philadelphia, relative to other U.S. cities. Skills shortages have intensified the most in Salt Lake City, San Antonio, and West Palm Beach. Skills abundances have intensified the most in Raleigh-Durham, Columbus, and Boston. And the cities where skills gaps narrowed the most over the past year are Oklahoma City, Greenville, and Jacksonville. Read on for the skills in shortage and skills in excess in each of these cities. Yes, Americans are still moving — Seattle, Denver, and Austin consistently topped our list of cities gaining the most people in 2017. Denver climbed from No. 3 in January to No. 1 in November, representing a 5 percent increase in arrivals and displacing Seattle from the top spot. We also saw Las Vegas move from No. 9 to No. 5 over the course of the year, representing a 37 percent increase in arrivals. Of cities losing the most workers, Hartford continues to see a decline: from No. 2 in cities losing the most people in January to No. 1 in November, Hartford’s outflows have increased 5 percent since the start of the year. Other cities which have lost workers throughout 2017 seem to be improving their retention: Providence, which fell from No. 1 in net outflows in January to No. 2 in November, has seen a 19 percent decline in outflows, and Baltimore, which fell from No. 7 to No. 8 in the same period, has seen a 27 percent decline in outflows. Oil and energy industries jobs engine — Hiring in 2017 was up, on average, for all industries we track, but the gains were not distributed equally. Over the past year, oil and energy showed the most overall growth (30 percent higher), followed by manufacturing and industrial (15.7 percent higher), and aerospace, automotive, and transportation (13.7 percent higher). The industries with the least growth in hiring in 2017 were media and entertainment (2.2 percent higher), healthcare and pharmaceuticals (4.9 percent higher), and telecommunications (6.7 percent higher). In November 2017, the industries that experienced the biggest year-over-year increase in hiring were financial services and insurance (26.8 percent higher); oil and energy (25.4 percent higher); and manufacturing and industrial (25 percent higher). Click here to read more of our December LinkedIn Workforce Report.